Wedding jewelry advice and ideas. Add the right finishing touch. 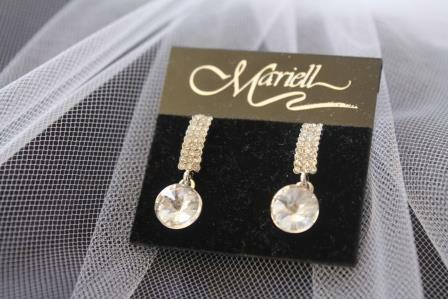 When selecting wedding jewelry, the brides first consideration should be how to compliment the gown. 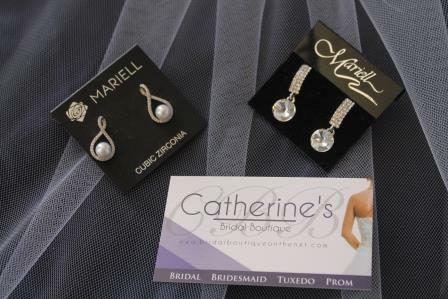 Most Strapless Gowns look great with a necklace! 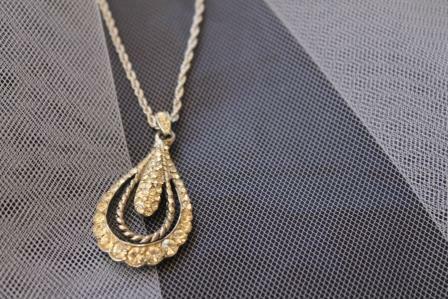 Opt for a necklace that complements the cut of your dress. 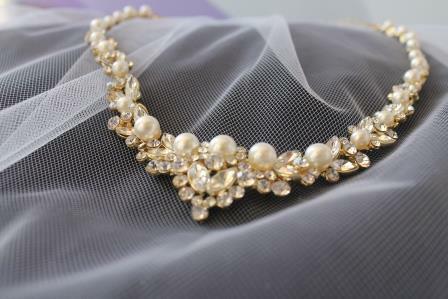 A pearl or rhinestone choker works well with a strapless bodice, whereas a diamond solitaire will look stunning with a V or sweetheart neckline. 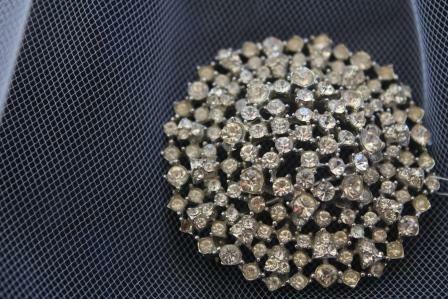 The style of the necklace will depend on the type of decoration on the bodice. 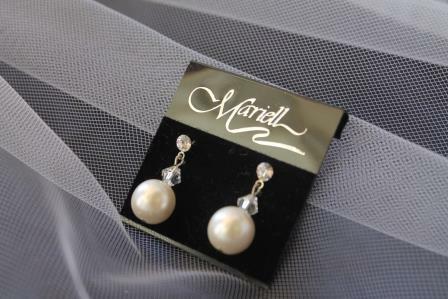 Tip: Consider the theme of your wedding and let your jewelry tell the story. Is your theme vintage? Hollywood red carpet? Traditional? Chic? Modern? A gown with no beads or embellishments is like a clear canvass that the bride can use to create her own custom look. You are limited only by your imagination! A gown with a beaded bodice will still look great with a necklace, but you must attempt to find pieces that will compliment the type of beading that is already on the gown. This should not be a difficult task, as most gowns have a combination of embellishments on them, such as rhinestones, pearls, bugle beads (both white and clear), sequins and/or crystals. 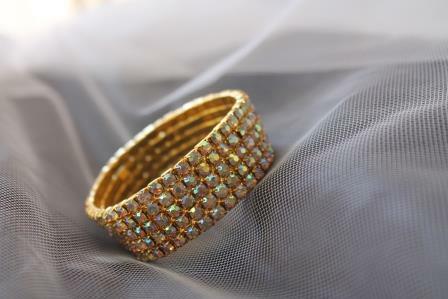 Tip: Harmonize the gemstones found in your dress or headpiece with those in your jewelry. 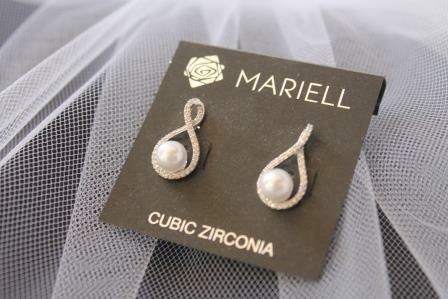 Pearls will complement seed beads, whereas rhinestones, diamonds or zirconia go well with sequins or crystals. 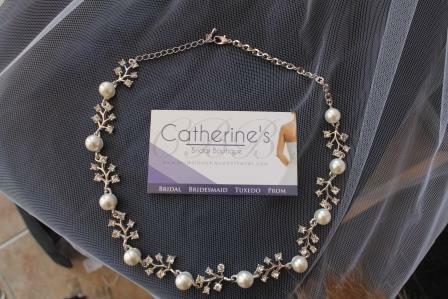 A necklace with stones that match even some of the beads on the dress will create a complimentary finishing touch. The size of the necklace will depend on your body type and your personal taste. 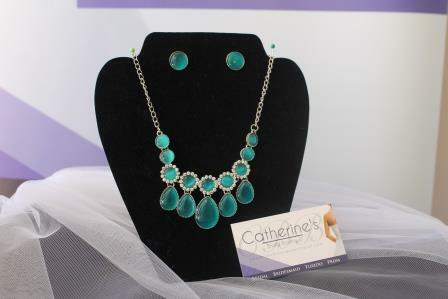 Try on many different types of necklace and earring sets and find the one that compliments the neckline of your dress as well as your body type. 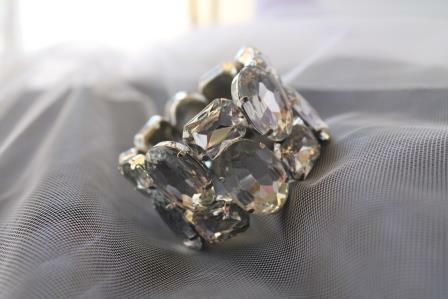 Look for pieces that are symmetrical to the style of your gown, as well as to the shape of your face. If your gown is a halter, or has tank or off-the-shoulder straps, consider a smaller necklace, coupled with larger earrings. Beaded straps are sometimes just enough decoration around the neck, that the only compliment necessary will be a knock-out pair of earrings! 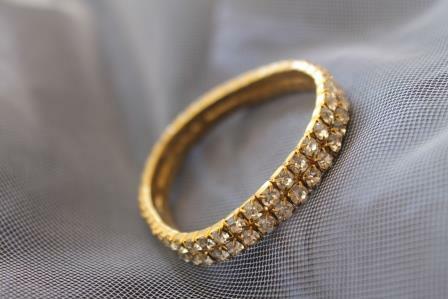 Tip: Consider a tennis bracelet over long, plain gloves or a rhinestone or pearl cuff over a bare wrist. The color of the gown is another important consideration. Is the gown going to be traditional white, or some other color? 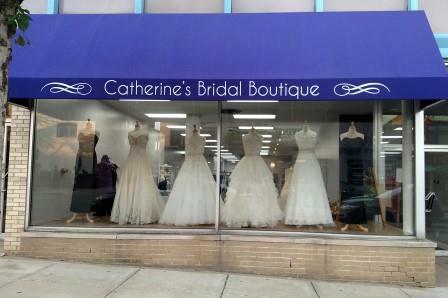 Many brides are choosing gowns in diamond white, ivory, gold, or champagne. Others are opting to include a bold accent color into their gown. If this is the case with your gown, you should feel free to coordinate with pieces that compliment these accenting colors. Deep-colored gem stones such as rubies, sapphires and emeralds add an elegant touch to bridal gowns with bold accent colors. Don't be afraid to use color to create a unique look. 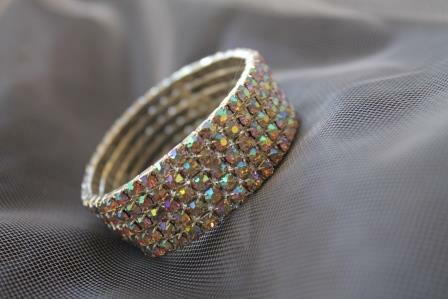 Tip: Wear similar metals so that you don't find your jewelry clashing. 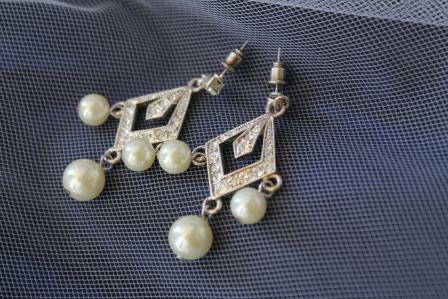 Let your hairstyle, headpiece and necklace dictate the earrings you choose. Chunkier styles and those with a drop look great with upswept hair, whereas simple studs or small bejeweled hoops may be the perfect addition to a dramatic necklace or decorative veil or tiara. 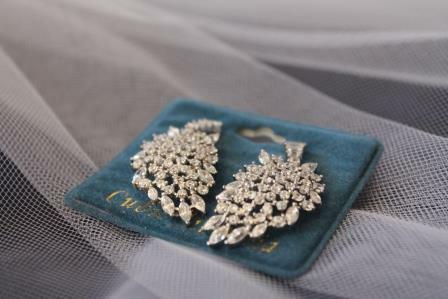 The jewelry and other accessories that you choose for your wedding, dance or other special occasion should be an expression of your personal style, as well as, be complimentary to your chosen gown. Don't be afraid to accessorize! Today is all about you!